At a time of growing resources shortages, electronic waste is a treasure trove of opportunity. Piles of discarded computers, phones and television sets tower toward the sky. These stacks of e-waste will be sorted through, their contents picked to pieces and eventually refined to retrieve the precious metals and traces of rare earth elements (REEs) inside. In Delhi’s string of scrap yards and warehouses, 1500 tons of disused electronics from domestic and overseas consumers are dumped every day. This is where 85 percent of the developed world’s e-waste ends up, according to the latest study by the Associated Chambers of Commerce and Industry of India. Looking like electronics graveyards, filled with stacks of hard drives, printers and keyboards, these facilities are where the work of urban mining takes place. In Delhi’s networks of formal and informal recycling units, where precious metals are salvaged from unwanted skeletons, an estimated 8500 mobile phones, 5500 televisions and 3000 computers are dismantled daily. The city generates 30,000 tons of e-waste annually, a figure that is projected to reach 50,000 tons by 2015. The United Nations Environmental Programme estimates that every year 50 million tons of e-waste are generated globally. To put this into perspective: if the electronic items were loaded into containers on a train, the train would stretch once around the earth. Metal deposits in e-waste are up to 40 to 50 times richer than ore extracted from mines. For example, one ton of gold ore yields about 5 grams of gold, but one ton of phone circuitry yields about 150 grams, 30 times as much. Urban mining presents an opportunity to reclaim and recycle precious metals and REEs that are used in prolific consumer and communication goods. But opportunities are being lost. Just 15-20 percent of the world’s e-waste is recycled annually. Reportedly, $21 billion — equal to the GDP of Zambia — worth of gold and silver are used in electronic gadgets each year, a promising reserve for any urban miner. 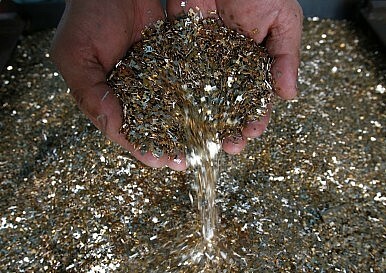 Yet less than 15 percent of gold and silver is recovered from e-waste worldwide. REEs are a group of 17 elements used in everything from weapons systems to green energy technology. Ibis World research found that green tech is 2013’s fastest growing industry. REEs play a central role in the construction of clean energy products: around 10 kg are used in electric and hybrid cars, double that of gas-guzzling cars, and two tons of rare earth magnets (containing 30 percent REEs) are used in the largest wind turbines. China maintains a stronghold on the highly sought after metals, controlling 97 percent of global production. As new supplies are pursued, urban mining presents a treasure trove of opportunity. So why isn’t everyone diving in? To do it right, urban mining requires proper facilities to retrieve precious metals. Too often, e-waste is incorrectly managed and the long-list of toxic materials contained within these mountains of electronics wreak human and environmental havoc. Despite trade restrictions on hazardous waste, e-waste is treated like any other commodity, traded in the global supply chain to reap maximum advantage. It is ten times cheaper for the United States to ship e-waste to Asia than it is to process it domestically. Developing countries with lax regulation and cheap labor become e-waste dumpsites for unscrupulous dealers, who fatten profit margins by avoiding the responsibility of dealing with e-waste ethically but more expensively in home countries. Greenpeace contends that developed countries are poisoning the poor by exporting their e-waste overseas. With bare hands and no protective facemasks, workers – children among them – are exposed to toxic fumes on a daily-basis. Tube-lights, motherboards and toner cartridges are burnt on open flames, spewing lead, mercury and cadmium into the air. Greenpeace recently released a short documentary filmed in Delhi. It shows a young girl stirring a cocktail of circuit boards and electric cables stewing in a plastic drum filled with acid, traces of copper and silver stripped out in the process, the depleted acid poured into local sewers. Others burn cords coated with PVC to recover the copper within. A child, wearing just a singlet, shorts and sandals, is shown chopping up computer batteries containing highly toxic cadmium with a meat cleaver. He is just one of between 35,000 and 45,000 kids aged 10-14 years, who work in Delhi’s e-waste industry.